Kurt Donald Cobain was born on February 20, 1967 in Aberdeen, Washington to mother Wendy Elizabeth Fradenburg and father Donald Leland Cobain. His first six days were spent in the city of Hoquiam, Washington until his family moved back to Aberdeen. His mother has German and English ancestry while his father was of Irish and French descent. Cobain has one younger sister named Kimberly. It was said that Kurt started to sing by age 2 and by age 4 wrote songs about their trip to the park which he sang and played on the piano. Cobain’s family was also a very musical. One of his uncle; Chuck was part of a band called ‘The Beachcombers and his aunt Mari played the guitar and performed in different bands throughout Aberdeen so he was always surrounded by music. While growing up his family described him as having a lot of charisma for his age. He enjoyed listening to music from artist such as the Ramones, The Beatles and Terry Jacks. When Cobain was 6 years of age, his parents had a divorced which proved to have a lasting impact on his life. His mother noted that Kurt became more withdrawn and his personality had changed dramatically. After the divorce, Kurt lived with his mother for one year and then with his father. After several years he started to live with different friends and family, but in the middle of 10th grade in high school he moved back to Aberdeen live with his mother. During this time Cobain was exposed to Christianity through his friend Jesse Reed who was a Christian. During his high school years, he focused more on his art courses and even though he excelled in physical activities he avoided them. Cobain loved to sketch, draw and paint, later on in his later life some of his paintings would appear in the artwork of many Nirvana albums. On his 14th birthday, his uncle offered him the option of a bicycle or a guitar as a gift, Cobain chose the guitar. He used his new instrument to practice many different songs until her began working on his own songs. While in high school he tried to form a band with friend, Novoselic, which lead to the beginnings of Nirvana. Cobain dropped out of high school two weeks before graduation after realizing that he didn’t have enough credits to graduate. His mother then offered him an ultimatum, to get a job or leave. About a week after Cobain found his clothes and other belongings packed away in boxes, he was forced out of his mother’s home. He stayed with different friends, sometimes in his mother’s basement and at one point even lived under a bridge over the Wishkah River. Kurt Cobain is most famous for his role as the lead singer, songwriter and guitarist in the rock band Nirvana. For the first few years of playing in a group Krist Novoselic and Cobain struggled to find a steady drummer until they eventually found Chad Channing and recorded their album Bleach which was released in 1989 on Sub Pop Records. 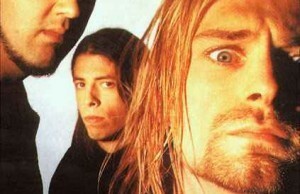 Eventually Cobain started to seek a replacement for Chad Channing because he was dissatisfied with his style and later found Dave Grohl with whom the group created their most successful album: Nevermind. When the album was released it sold 400,000 a week in the U.S.
Nirvana later released Incesticide, a collection of radio sessions that were previously unreleased as a way to circumvent bootleggers who were circulating their works. In September 1993 their album Utero was released and debuted at number one on the Billboard 200 album chart. In November 1993, Nirvana performed for MTV Unplugged and played only two of their hit songs. After Cobain died in 1994, the members of Nirvana disbanded and pursued their own personal musical journey. Grohl formed the Foo Fighters and Noveselic Formed Sweet 75. Despite the split of the band, several Nirvana albums have been released after Cobain’s death and Nirvana has been gone on to be one of America’s most famous and respected rock bands in their rock music history. Throughout his life, Cobain suffered from chronic bronchitis and intense physical pain due to an undiagnosed chronic stomach condition which he spent years trying to find the cause. Doctors said that the cause could be as a result of the stress from his performance or possibly from his childhood scoliosis but no solid diagnostics was given. Cobain abused alcohol and solvent and also took LSD at some point in time. In 1986 he began using heroin which had been recommended to him by a local drug dealer. Though at this point he only used it periodically by 1990 he became a full-fledged heroin addict. He stated that he used it as a way of relieving himself of the pain from his stomach conditions. Eventually Cobain’s use of heroin began to affect his stage performance and sometime he would pass out during photo shoots. While performing at a show in 1989, Courtney Love saw Kurt Cobain and developed a crush on him and in May 1991 they were introduced. From then after Love began to pursue Cobain. In the fall of 1991, they would be seen together often. Cobain’s addiction to heroin worsened until he went to rehab in early 1992 after Love found out that she was pregnant with his child. On Monday, February 24, 1992, Cobain and Love married in Hawaii on Wakiki Beach. Afterwards on August 18th their daughter, Frances Bean Cobain was born. Cobain and Love were known drug addicts and were even taken to court by the Los Angeles County Department of Children’s Service under the claim that the couple’s drug usage made them unfit to be parents. After the trial, the judge ordered that their two week old daughter should be taken from their custody and placed with Courtney Love’s sister for a couple weeks. They had to visit the social worker regularly and perform urine test before they could gain back full custody of their daughter. On April 8, 1994, an electrician arrived at Cobain’s Lake Washington home to install a security system and found Cobain’s body. At first he thought he was asleep until he saw the shotgun pointing to his chin. The electrician reportedly saw blood coming from his ear and a suicide note beside him but no visible sign of trauma. The coroner’s report estimated that Cobain’s body had been there for about three days, they also found heroin and Valium in his body. Kurt’s death at the age of 27 made him a member of Club 27, a group of talented musicians who all died at the young age of 27. 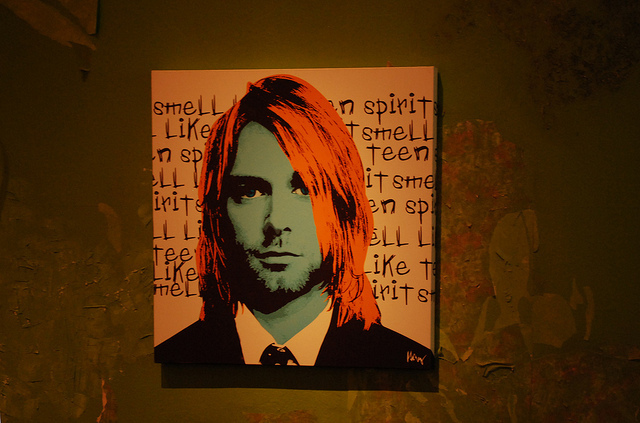 Read Kurt’s biography at Club 27.